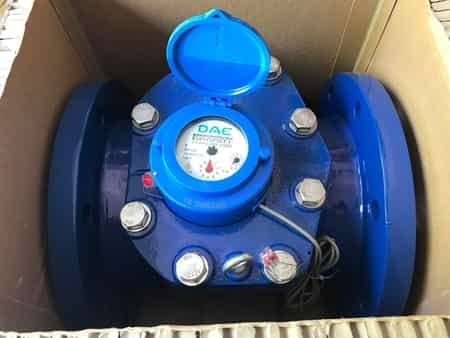 Type: 8 inch Woltmann Helix Water Meter with Pulse Output, Measuring in Gallon. 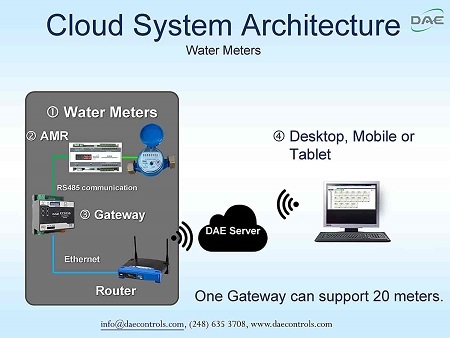 Cloud Metering available with DAE 2030 Gateway. 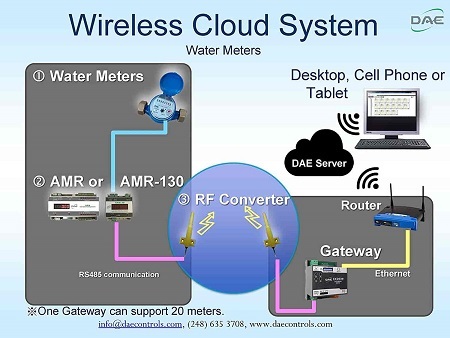 DAE CC2030 gateway will get the water consumptions from DAE AMR (Auto Meter Reading Module with RS485 communication for 16 water meters with Pulse Output) or DAE AMR130 (for 1 meter) and send them to the cloud (DAE server) through Ethernet. With PC or cell phone or tablet, the building owners or property managers will therefore be able to get access to real time data as well as the monthly water consumption and billing reports to their tenants. Factory calibration certificates available for government contracts. 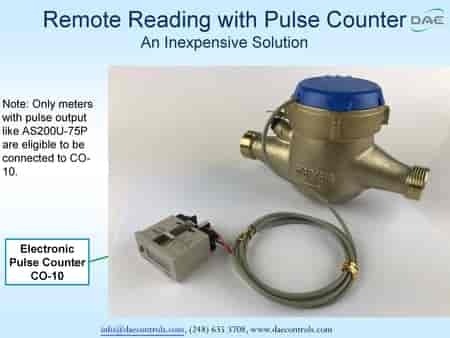 Ready for use with CO-10 Electronic Pulse Counter - An inexpensive remote reading solution. Wireless remote reading available with DAE RF converters. If you are interested in cloud metering or wireless water management or looking for a large quantity, please contact us. 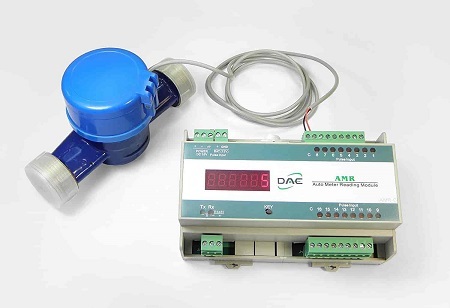 Ready for use with DAE AMR130 (Auto Meter Reading Module for water meter), and AMR (for 16 water meters) for remote reading. 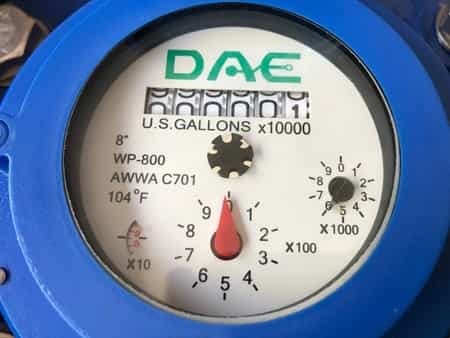 Only two wire connection between water meter and AMR or AMR130 or CO-10. It is not required for additional power source. If you are interested in cloud metering or wireless management or looking for a large quantity, please contact us. Mount: Horizontal position with dial facing upwards or sideways. It is not recommended to have dial facing downwards. It can also be installed vertically with water flowing upwards. Meter must be installed with direction of flow as indicated by arrow cast into the meter body. Install valve before inlet of meter. A valve at outlet is also recommended. 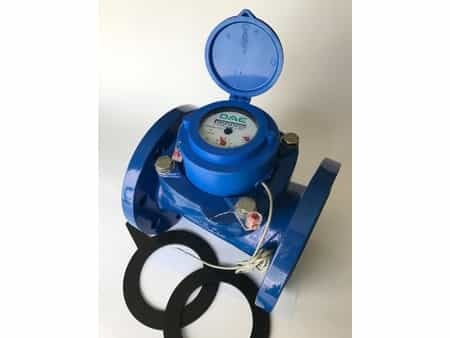 Install meter in a location with at least 10 diameters of straight pipe at the inlet and 5 diameters at the outlet to assure proper flow profile to meter. Accuracy: ±2% as per AWWA C701 test procedure. Gallon Per Pulse: 1000. The pulse emitter device consists of a plastic housing with Reed Switch and 1.5 m cable with 2 cores in red and black. Item dimension: 13.8 inch length, 13.5 inch width, 14.7 inch height. Weight: 112 lbs. Max. Reading: 9,999,999,999, Min. Reading 1 gallon. The last digit has a multiplier of 10000 gallons. Reading on 1st picture of the listing is 5999 gallons. Conforms to AWWA C701 and ISO4064. The meter register assembly can be removed for repair or replacement without disrupting the process flow. Operate at low pressure loss and offer excellent accuracy. Ready to interface with DAE software EnergyLink400 for remote reading and billing. Most of our customers will be able to receive their items in 3 business days (Continental US). If you order by 4:30pm Eastern Time Monday through Friday and by 1pm Saturday, we shall deliver in the same day. 2 year warranty from the seller.